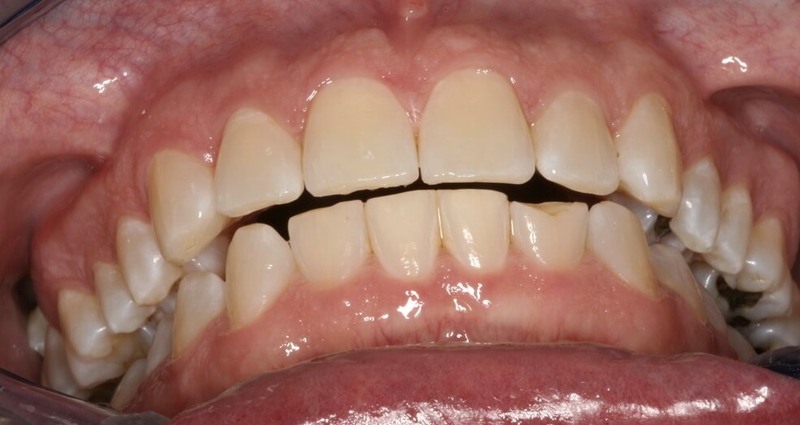 In a recent post I looked at the concept of opening vertical dimension in restorative cases. There are many things to consider when incorporating the idea of altering vertical into a treatment plan. One of the questions we have about opening VDO is whether or not it will be stable over time, since we are lengthening the masseteric sling ( masseter and medial pterygoid muscles). One of the things I hope for when I consider opening vertical is a slide from centric relation ( seated condylar position) to intercuspal position. The difference in relationship between the mandibular teeth and maxillary teeth when comparing centric to ICP has three components, vertical, anterior-posterior and lateral. It is the vertical component and the rotation of the mandible that is helpful when considering opening vertical. When a patients condyles are seated int he fossa as compared to their position in intercuspal position, they move upward into the fossa. This upward movement shortens the masseteric sling. At the same time due to the rotation of the mandible the patients chin and anterior teeth move down away from their maxillary teeth. This rotational movement creates vertical space that is largest at the centrals and diminishes until the teeth are touching at first point of contact. This space may be all, most or some of the room we need to restore the teeth and open the vertical dimension. At the same time the seating of the condyles has created a reproducible position from which to restore, and shortened the muscle length, reducing or eliminating the risk of the vertical relapsing over some months time. This is a great post Lee Ann! Opening the vertical is so important for restoration of a severely worn dentition. Interesting to note is that the case becomes a little more Class II by doing so. This helps with Class III correction, is O.K. with Class I, but makes Class II correction more difiicult. Figuring our how you will solve overbite and overjet are necessary before we ever change vertical for a patient, Mounted models are extremely helpful int hat regard. What exactly do you mean by “stable”? Meaning pain over time? A change in the bite? What types of negative things can happen when you open a vertical and are there any ways to predict who is going to have these types of problems? How much faith do you put in the adaptability of the human body? Great question. Stable means all of those things, no pain, no changes over time and no phonetic issues. Pain is almost never an issue with opening VDO, so little that I do not even consider it. Phonetics should be figured out in a direct composite mock-up or provisionals phase that the patient is in for a period of time, and this is the most common issue that has to be worked out. Stability as far as changes will not happen at the level of the occlusion but at the level of the bones, and can be tracked with Cephalometric radiographs, but again is not normally an issue as it does not affect the esthetics or the function.